When out on a walking trip a sudden downpour can ruin your day. Therefore, it’s important to be well prepared and to ensure that you stay as dry as possible, yet at the same time, still feel comfortable when wearing your ‘outer layers’ as they’re more commonly known. All outer layer clothing should be roomy enough to fit over all of your other clothing layers without sacrificing your comfort or restricting your movement. However, it should also be snug enough so as not to flap around wildly in windy or stormy conditions. When it comes to choosing between clothing with zips over pullover tops or pull up pants, it’s easier to get into and out of zipped outer layers but more zips mean more chance of leaks so that will be down to your personal choice. Outer layer clothing comes with various specific features which can have a significant effect on your comfort. Adjustable openings at the cuffs, neck and waist, for example, should open easily for ventilation yet you should be able to quickly seal them tight in bad weather. Vents aid breathability and include underarm zips, side zips, mesh lined pockets and draft flaps. Larger vents tend to be more effective than smaller ones but they can also leak more easily. Pockets enable you to store essential items and you should look for those which are easily located, easy to open and close and which are well protected against leaks. However, bear in mind that the more pockets you have the greater the tendency to store more things on your person which means more weight to carry. Any decent outer layer garment should have a protective hood. Those which are permanently attached offer the best protection against leaks whilst those which are detachable and which can be conveniently folded and stowed away when not needed are often easier to deal with more quickly. Gaiters can seem unfashionable but are extremely invaluable if you want to keep your legs and feet dry and keep unwanted items such as bits of rock, dirt and mud etc. out of your boots. By keeping out such ‘foreign’ objects, this also reduces the chance of you suffering from blisters so they shouldn’t be dismissed lightly. For hikers, you can choose between ankle and calf high gaiters and you’ll probably want to choose a waterproof pair with the upper portion made of a breathable fabric so that you don’t get too sweaty. This is usually the cheapest option and will offer protection against wind and light showers. 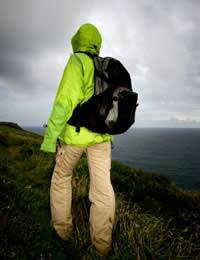 It’s ideal if you’re planning a relatively short trip when the weather is set fair but won’t protect you against more harsh weather or a sudden prolonged downpour. On the plus side, this will offer you complete protection against heavy rain but can be extremely uncomfortable as moisture is unable to get out which means they either have to be cut loose and worn like a poncho or have special vents built into them to let the heat and sweat out. Naturally, this is usually the most expensive fabric to be used for outer layer clothing. Overall, this is the best option if you can expect heavy rainfall as it can be used in a wide variety of conditions and situations. However, although the designs and performance for this kind of material is improving all the time, exact performance with regards to breathability can vary depending upon extraneous factors such as temperature and the type of activity you’re undertaking. However, for seasoned walkers who like to prepare for the worst the weather can throw at them, this type of outer layer fabric tends to be the preferred option. Breathable and waterproof hats, gloves and mitts are also useful additions when considering protective clothing when out walking, depending on the weather and climate.